What is a CCC certificate in China? CCIC stands for China Certificate & Inspection Group China. The group is the certification organization, which provides various services related with inspection, verification and certification of products manufactured in China (or imported to China). CCIC is appointed by AQSIQ (Administration of Quality Supervision, Inspection and Quarantine), the governmental institution responsible for controlling the entry and exit of goods in China. Below we present some basic knowledge about the operations of CCIC and the certificates issued by the group. CCC stands for China Compulsory Certificate. Roughly speaking, it is an equivalent of CE certificate used in the European Union. The CCC is in use since 2002 and is applied for the following categories of products: electrical wires and cables; switches for circuits, installation protective and connection devices; low-voltage electrical apparatus; small power motors; electric tools; welding machines; household and similar electrical appliances; audio and video apparatus; information technology equipment; lighting apparatus; telecommunication terminal equipment; motor vehicles and safety parts; motor vehicle tires; safety glasses; agricultural machinery; latex products; medical devices; firefighting equipment; detectors for intruder alarm systems; wireless local area network (WLAN) systems and toys. Another category of products is IT security products, which include: secure operating system product; safety isolation and information exchange product; secure router product; security supervising product; secure database system product; countermeasure product for spam (trouble/nuisance) mail; firewall product; invasion detect system product; data backup/recovery product; network secure isolating LAN card/switching hub product; network vulnerability scanning product; website recovery product and smart card COS product. Detailed list is presented here. 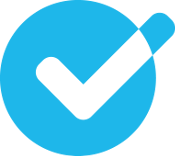 If you know the HS Code of your product, checking the list will be even easier. The application takes around 4-8 months to proceed. It includes product testing and sometimes factory audit. After factory audit, the manufacturer has 30 days to address non-compliances and solve all problems. CCIC has its offices abroad in many countries, including USA, United Kingdom, India or Spain. The companies that export to China are also subjected to follow-up certification, once a year a factory audit may be performed. In the case of a denial, the report will be issued, explaining the reasons of rejection. 2. CCC Certificate – how does it look like? The picture above presents the typical CCC certificate. 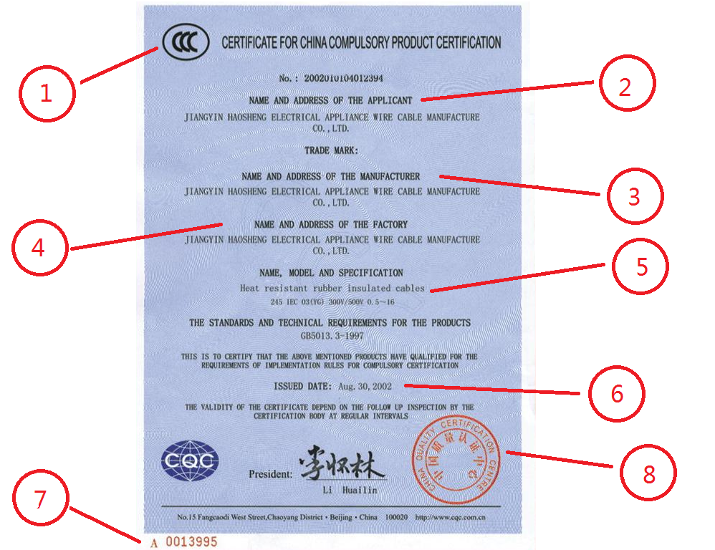 1 – CCC logo, 2 – name of applicant, 3 – name and address of the manufacturer, 4 – name and address of the factory, 5 – name of the product, 6- date of issue, 7 – serial number. 8 – CCIC official stamp (print). Currently, there is no way to verify the validity of certificate online; it can be done by contacting one of the CCIC offices.